Award winning author Rick Anthony lives with his wife Lisa and daughter Zoë in Regina, Saskatchewan, Canada where he was born and raised. When Rick isn't writing a novel or screenplay he enjoys spending time with his family and painting. Red Smoke Rising is an action packed science fiction adventure. Rick Anthony has created a world filled with violence, trolls, zombies, ogres, dragons, shape shifters, enhanced humans and power hungry leaders. Many years ago the Myrmidon Empire invaded Muoro, Frimuor and Wild Lands to control Ku, a drug that allows the user great powers. The citizens of the occupied lands were enslaved and tortured. An Underground movement is preparing to fight back. They have stolen the drug, learned how to use it and are training for battle. Most shape shifters have a Master, Mia is the exception. Mia is her own master, she can transform into a tiger, horse and eventually another very special beast. She is a young woman with compassion, intelligence and resilience. Along with Kale, Sheri, and Grere, she fights for her freedom and for her life. 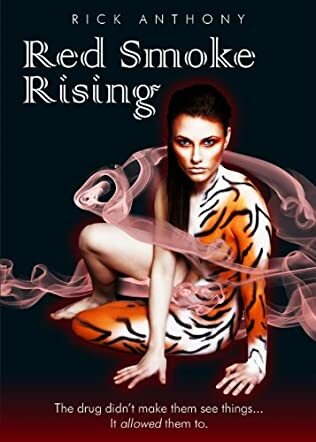 Red Smoke Rising begins with an action packed theme that immediately captured my attention. I literally could not put this book down and read all 320 pages in one day. The plot is intense. The characters are wonderfully written. Mia is the lead character which I've already described. She played well with Kale. I could picture Kale in my mind. His strength of character was incredible. I have to mention Mir. She was very dislikable. She took pleasure in torture, pain and blood. Adon showed a bit of redemption toward the end. Rick Anthony is a master at characterization. He even fully developed the secondary characters. He skillfully used words to create a tapestry upon which the scenes played out. My one criticism and it is minor, is the cover. I do not think it fit well with this book. It is too suggestive. This book needs a cover that screams power, battle, shape shifter, etc. But a suggestively posed and dressed woman could give the reader the wrong idea. In no way does it fit with the plot. Red Smoke Rising is science fiction at its finest. Rick Anthony is now at the top of my list of new authors to watch. Great to see Rick congratulaions!! !